Turning to silver, prices rose into a critical resistance zone between $14.75 and $15.00 per ounce. Silver has traded in that area many times over the past couple months but it hasn’t managed to close above the $15.00 level since August. A break above that stubborn chart resistance could force a lot of institutional bears in the futures markets to cover their short positions. A big short covering rally could then follow. Silver currently trades at $14.58 per ounce on the heels of a 0.7% weekly decline. Platinum prices are down 0.9% this week to trade at $792. And finally, palladium looks lower by 0.3% as prices for the white-hot white metal come in at $1,237 per ounce to essentially trade at parity to the gold price. Next week’s trading could get volatile following the much anticipated Fed meeting. Policymakers are expected to hike interest rates once again, but they may strike a dovish tone for 2019. St. Louis Federal Reserve Bank president James Bullard recently called for his colleagues to hold off on further rate hikes. Wall Street and Washington are also putting pressure on the central bank to pause. President Trump continues to express frustration and concern over rising interest rates. He sees a threat not only to the stock market but also to the government. The Treasury Department is being forced to go on a borrowing binge due to rising budget deficits. It faces higher borrowing costs as it rolls over trillions of dollars in debt at higher interest rates in the months ahead. The Treasury Department reported on Thursday that the federal government ran a higher than expected deficit in the month of November, coming in at $205 billion. That’s an alarming amount of red ink to spill in one month. Federal spending for November was up 18% compared to the same month just a year ago. There is plenty of blame to go around for the rampant fiscal irresponsibility in Washington. Congressional Democrats insisted on boosting domestic spending. Congressional Republicans insisted on boosting military spending. And President Trump failed to use his veto pen when bloated bipartisan spending bills reached his desk. The President is now telling Democrats he is willing to shut down the government over funding for his proposed border wall. Unfortunately for Trump and his allies in Congress, they have little negotiating leverage over Democrats. Republican leaders have already caved on funding Democrat priorities in the budget. The GOP love to talk about cutting wasteful spending and shrinking deficits when Democrats are in charge. But it’s all talk. When voters entrust Republicans with the power to put words into action, they make excuses for why they can’t. Only a small handful of Republicans, it seems, are actually willing to vote for smaller government. One of them is Senator Rand Paul. He recently weighed in on the budget deficit and the prospects for a government shutdown. Sen. Rand Paul: I'm not for shutting the government down on purpose. But I'm also not for keeping it open and spending a trillion dollars we don't have. And so, I think we really out to have a big knockdown, drag out fight but, it out to be over how much deficit we have. So, about a year ago the Republicans, unfortunately my party, gave up on spending caps. And so, the deficits that we're having right now, about a trillion dollars a year, are about as bad as they were when I ran for office pledging to stop President Obama and the Democrats from borrowing so much money. I'm still voting that way but unfortunately, some of my brethren in the GOP decided that it was more important to spend money. But it is a real problem and it makes our country weaker to have a burden of a $22 trillion debt. Annual interest payments on the national debt will soon become the largest single expenditure in the federal budget. The trends of rising deficits and rising interest rates are pushing the country toward a funding crisis that now seems unavoidable. The time for a possible political solution has passed. The only solution remaining for unsustainable federal finances is monetary in nature. The debt will have to be monetized – bought up by the Federal Reserve in some future Quantitative Easing program that will make the last one look like small potatoes. At next week’s Fed meeting, officials could drop some hints that they are preparing to change course. A dovish Fed would likely trigger a sell-off in the U.S. dollar and a rally in inflation-sensitive assets, including precious metals. Mike Gleason: It is my privilege now to welcome in Gerald Celente, publisher of the renowned Trends Journal. 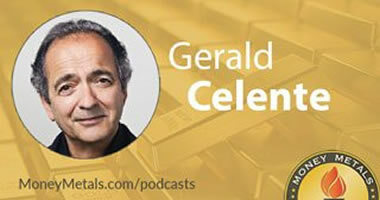 Mr. Celente's perhaps the most well-known trends forecaster in the world and it's always a joy to speak with him. Mr. Celente, thanks for the time again today and welcome back. Mike Gleason: Well, Gerald, as always, there's no shortage of topics to discuss with you. Why don't we start with Europe? The Yellow Jacket Protests have been making headlines. The French President Macron is extraordinarily unpopular and citizens there are more than a little frustrated on how out of touch the government is, both in France and in Brussels at the EU. People have taken to the streets, Macron has responded by delaying the very unpopular fuel tax hike and he plans to increase wages and pensions. But France, like all governments, is already spending well beyond its means and will have to borrow the money to pay for Macron's social programs. French bonds were hit hard yesterday. Are we getting to the point where the rubber meets the road and people are finally reaching their fill of corrupt and out-of-touch politicians making promises they can't keep? Gerald Celente: Yes, it's going on and that's what the whole Yellow Vest movement is about. And interestingly enough, who the leader of it was: no one. It all happened spontaneously and it all happened over the Internet. And when you read the quotes from the reports from the news, they say things like, "The uprising is mostly organic, spontaneous, and self-determined." It's about the inability to pay the bills and it's about the people are tired of the rich getting all of the breaks and that's what a lot of Macron's new budget is. It gave a big wealth tax breaks to the richest and the poorer people can't make ends meet and it's in piece after piece. And by the way, the same thing just broke out in Brussels this past Saturday, this same exact reason. So, it's going on, it happened in Italy with the five-star movement, it's anti-establishment and people are tired of all the big breaks going to multi-nationals as they just become workers on the plantations in Slave-landia. The only place it's not happening is in the United States. Mike Gleason: While we're talking about Europe, please let our listeners know about what you're expecting out of Britain. The Brexit vote was held two and a half years ago. Since then, politicians have been arguing about the details and many have been working to subvert the will of the English voters and either avoid leaving the EU or set up an exit agreement that ensures the UK will be as much, or even more beholden to the bureaucrats in Brussels. Do you have a sense of what might happen there? Will Brexit happen and will the UK be able to achieve genuine sovereignty or is the leadership there going to be selling out? Gerald Celente: We think they're selling out, but again, it's all connected. Why is there resistance to Brexit? It's because the multi-nationals don't want it. That's all this is enriching, but when we look going back to Europe and what's going on in France, in Brussels, in Italy and Poland and Hungary, in Austria with all the new parties. What we saw, what's happening to Merkel, the Chancellor of Germany. You're seeing a breakdown of the system. As we see it, it's the beginning of the end of the Euro group. There's going to be, at some point in the not-too-distant future, a few years away, maybe several, the end of the Euro and countries going back to their own currency and not the dictates of Brussels and the Euro Zone. Mike Gleason: Now, I'd like to toggle over to the U.S. Trump and the Mueller investigation has been the dominant news story from more than two years. A lot of us are getting fatigued and frustrated, we would prefer more focus on productive topics, swamp draining and balancing the budget being two of them. But the Democrats have regained control of the House and they are promising more investigations. It isn't hard to imagine another two years of the same sort of drama and very little happening that's worthwhile. But what are your thoughts about what to expect from Washington over the next couple years, Gerald? Gerald Celente: What did you expect from Washington over the last couple of years? You expect nothing from Washington. It's more of the same and it's going to be the same kind of stupidity, the same kind of decisions made that don't benefit the entire nation and it's again, it's what I said before, this is the only major country where you're not seeing progressive change in terms of overthrowing a corrupt, inefficient establishment and that's what's going on around the world… in the Western World, but not here. So, it's going to be more of the same, but worse. Mike Gleason: On that note, there is building frustration and we wonder if the mass protests that's happening in France and elsewhere will be happening in the U.S., but there really isn't much coherence to people's frustrations. Some of the angriest people seem to hate President Trump, but they don't really have any plan they can sell as an alternative. What do you think, is their movement large enough or organized enough to put a few hundred thousand protestors on the streets here any time soon? Gerald Celente: Again, it's up the individuals. As I mentioned, you're looking at the Yellow Vest Movement, it wasn't an organized movement. It was the people unified with the same basic complaint. Their standard of living is rapidly declining, the taxes are going up that are affecting the smaller people, the big tax breaks are being given to the wealthiest, and so it was an organic movement. You don't have that here in America with identity politics being the Divided States of America. Not having a goal to achieve by a large group of people, So, we don't see anything of that nature happening in this country at this time. Mike Gleason: Gerald, I know you're looking for some real financial turmoil in the markets as we move into 2019. What trends do you expect people to be talking about and how do you see things playing out in the New Year economically? Gerald Celente: Two days before the markets in the states hit their high on September 11, we issued a trend alert about an economic 9/11 and two days later, the markets peaked and now, you're looking at the S&P and NASDAQ basically down into correction territory, floating in and out of it. All of this talk about tariffs and trade wars is nothing more than talk. It's not the issue. When you're looking for example, China's latest numbers on auto sales, they have had the biggest decline since 1990. They're down 13 percent in November, they're down for several straight months. That has nothing to do with tariffs. The real estate market is going down, luxury good orders are going down. The economies are going down, but they keep putting out their tariffs and trade wars. It's all about cheap money. It's about interest rates, period, paragraph. You just saw what happened in India, they just threw out the Central Bankster, because he wasn't paying attention to Prime Minister Modi, who didn't want them to raise interest rates and they didn't and wants looser money policies. So, the markets are going up and down on basis of where interest rates are going to go and that's the beginning and the end of the story. All of Trump's tariffs on China, they equal the grand total of 0.7 percent of their GDP. So, it's not tariffs or trade wars, it's cheap money flow and now you're looking at, you go back to September, that's not ancient history, when you look at the futures markets, they were betting that in 2019, the United States Federal Reserve was going to raise interest rates three to four times. Now, you know what that bet is down to? Two percent believe that's going to happen. So, what we see is more monetary methadone being shot into the Wall Street bowl to keep it alive. But again, it's only a meth high and at some point, it'll run out. Mike Gleason: Yeah, it certainly seems like the markets are reacting to the fact that maybe that stimulus is coming to an end and you’ve got to think the Fed officials are keeping a close eye on that. And we agree, we're not got to see nearly as many rate hikes as many are expecting. How do you expect metals to react to all of this? Is 2019 shaping up to be a good year for gold and silver in your view? Gerald Celente: Yes, we do think it's going to be a good year. Look, I've been on your show a lot of times and you well know that I forecast that the bottom of gold would be $1,200 an ounce. I was $15 off, it went to $1,185 one day, so that's gold's bottom. And what you're looking at now with gold around the $1,250 mark per ounce is because of the expectations of more cheap money. The more cheap money that flows out there, the more precious, precious metals become. So, that's the way we see it and 2019, we believe that they're not going to save the global economy. You're seeing one report coming out after another, day after day, whether it's the IMF, the Organization of Economic Cooperation and Development, the World Bank, you're hearing from the previous Fed Chair Yellen. One after another warning of the debt bubble and other problems coming about in 2019. Cheap money won't do it and if you need any more proof, all it will do is temporarily boost it. Just like a heroin addict, again this is monetary meth, yeah it juices him up for a little while and then they go under and eventually they OD. Take a look at Japan, look at their last GDP numbers. They came in at -2.5, that's despite negative interest rates. The Japanese Central Bank taking in $5 trillion worth of debt, more than the entire GDP of Japan with negative interest rates, negative bond yields and they still can't pump up the market. Mike Gleason: We'll be watching that closely. Well, as we begin to close here, any final comments, any other trends that you're keeping a close eye on that maybe we haven't touched on? Gerald Celente: Well, yes, you're going to see a lot going on with this migrant crisis. One of our top trends for 2019 is human waves and it's not going to stop. It has not only to do with the wars of the Middle East, whether it's Libya, Syria, Yemen, Iraq, Afghanistan. It's coming out of Central America, South America. It's coming out of Africa, because people can't get jobs and they're living in countries with corrupt governments, high levels of violence. So, you're going to see a human wave continue and to put it into perspective: 100 years ago, there were 1.6 billion people on the planet. We've added another 7 billion in 100 years. There's not enough jobs, not enough work, not enough income. So, you're going to see the migrant issue and the refugee issue be major issues particularly in North America and in Europe in 2019. Plus, of course, there are several other major mega trends for 2019 that we have in the Trends Journal that we'll be releasing within a week. Mike Gleason: Well, excellent stuff. We really appreciate the time today and before we sign off, please tell listeners how they can get their hands on the just mentioned tremendous information that you put out there at the Trends Journal, the various mediums that people can take advantage of. You're putting out Trend Alerts on a regular basis, it's fantastic stuff. Gerald Celente: Yes, just go to TrendsJournal.com. And guaranteed money back. That's the only place you're going to read history before it happens. Besides the monthly Trends Journal, we do Trends in the News broadcasts Monday through Thursday and as you mentioned, we do trend alerts each week. Mike Gleason: Well, that will do it for this week. Our sincere thanks, again, to Gerald Celente, publisher of the renowned Trends Journal. For more information, the website is TrendsJournal.com, be sure to check that out.